We have taken a look at a fair share of GeForce RTX 2070 graphics cards and the consensus is that those priced at entry levels, or $499 (£460), make the most sense. Many of these cards overclock past the specifications of more expensive OC models, saving you, potentially, over £100 in the process. All of Nvidia's add-in card partners have something at this £460 price. Today, we take a look at what Gigabyte can do with its WindForce model. Let's get out of the way what the card doesn't have when compared to premium models. There's no factory overclocking on the core, so speeds are 1,620MHz boost and 14,000MHz memory. That said, our sample managed a respectable 1,750MHz core across our games. It's not built as well, either, and feels cheaper than the price tag. But that, on the face of it, is pretty much all you sacrifice. Gigabyte adopts custom cooling, basic RGB lighting, a full-width backplate, and maintains a strict two-slot form factor. All good, you would think, but there's more to it. The problem lies when you start a game and temperature creeps up and over that 60°C threshold. The rather flimsy fans spin up aggressively, from 0rpm to 1,100rpm, and then, if temperature hovers around 60°C, oscillate between off and high speed. The upshot of this is a very, very noticeable and annoying revving sound as the fans go from off to on to off within a second. Depending upon the load the game imposes, this revving can last 45 seconds - it does in Battlefield V during the intro sequences - and then the fans stay on. Point is, all cards that feature a 0rpm mode have some form of revving, but it is far too noticeable for Gigabyte, and something the engineers need to work on with a custom fan curve that increases rpm gradually and consistently. 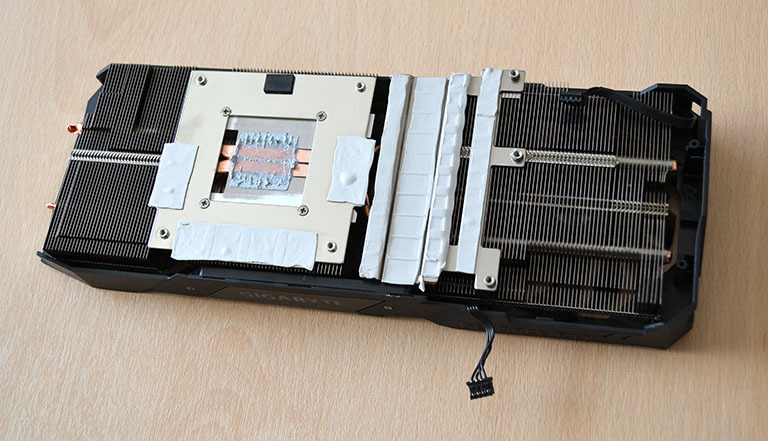 Back to the card, Gigabyte appreciates you don't need to go overboard for RTX 2070 cooling, and the WindForce adopts a card-wide heatsink whose capabilities are augmented by two heatpipes that converge and flatten at a copper block that makes contact with the GPU. Another custom heatsink concurrently cools the VRMs and memory. As is clear, there's very good coverage between the heatsink and card, with thermal pads everywhere that's important. Stripping it to the bare PCB, Gigabyte keeps costs in check by adopting what appears to be a reference-style PCB. That means a 10in-long card, 8+6-pin power connectors, and a lack of SLI connectors. Being an entry-level card precludes a second BIOS or enhanced power circuitry, but as you will find out later in the review, the card is an accomplished overclocker. Last but not least, a full-width heatsink is good for the £460 price point. Going by our own RTX 2070 reviews, only the MSI Armor, at the same price, has said backplate. Other than that really annoying speed-change on the fans, there really isn't much wrong with the card. Let's now see how it benchmarks.